Various Music Boxes, Music Figurines and Musical Sculptures. Secure Shopping, Only U.S.A. Shipping. Enjoy the beauty and inspiration this religious music box brings to every day! The first-ever musical prayer box to feature the inspiring artistry of Thomas Kinkade, Painter of Lightâ„¢, it is crafted of lustrous Heirloom PorcelainÂ® and has a specially designed compartment to holds your most earnest prayers. The exterior showcases the peaceful serenity of Mr. Kinkade's painting, Garden of Prayer - what a lovely religious inspirational gift!Available exclusively from Ardleigh Elliott, this limited-edition religious decor also features a quotation from the Bible beneath the lid. It plays the melody of "You'll Never Walk Alone." A tangible symbol of the power of prayer, it makes a very special religious inspirational gift too, so don't wait. Strong demand is expected. Order now! Thomas Kinkade's snow-dusted village scenes and visions of holiday gatherings have always captured the simple joys that make the holidays sparkle. Now, rediscover the splendor of Christmas with this dazzling limited-edition Thomas Kinkade snowman, a merry masterpiece with lights, music and motion available exclusively from The Bradford Exchange. This festive, fully sculpted Thomas Kinkade Christmas decoration showcases 3 beloved Kinkade paintings on his coat and top hat, along with an intricately hand-painted Thomas Kinkade-inspired village at his base and inside his crystal-clear glass body. Flip a switch and holiday music plays, the village glows with light, and a miniature train circles 'round. Delicate metal snowflakes and SwarovskiÂ® crystals dangle from silvery strings as the snowman sprinkles the town with snow. This one-of-a-kind musical Christmas decor is sure to cause a flurry of demand, so hurry - order now! Everyone dreams of an old-fashioned Christmas! 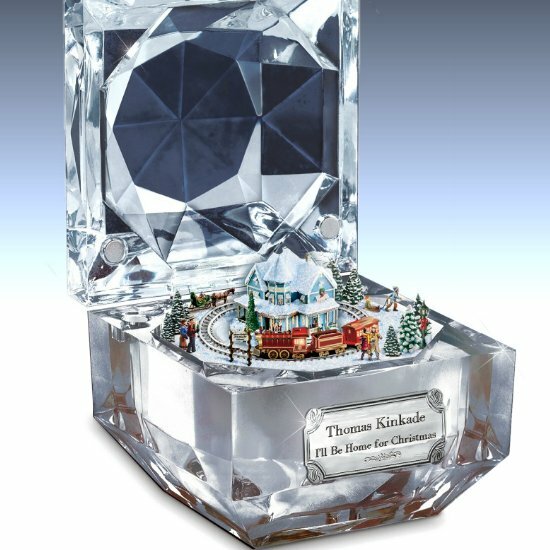 That special feeling is captured in this first-ever Thomas Kinkade genuine crystal music box with sparkling multi-faceted crystal in an emerald-cut shape with deeply incised elegant designs, flourishes and edges. Lid lifts off to a heartwarming, handcrafted and hand-painted holiday village showcasing well-loved Thomas Kinkade village scenes - with intricately sculpted Victorian homes, a horse-drawn carriage and more. Flip the switch to hear "We Wish You a Merry Christmas" as skaters circle the pond.This keepsake collectible music box is a limited edition, available only from The Bradford Exchange. Crystal lid has the artist's name and "Holiday Reflections" in etched-look script. A replica of Mr. Kinkade's "Victorian Christmas" home on the front is also crafted in the look of traditional etching. Strong demand is expected for this heirloom musical treasure and important Thomas Kinkade village collectible, so order now! No one captures the joy of simple holiday traditions - family gatherings, building a snowman, Christmas caroling - quite like the Painter of Light â„¢. Now you can treasure these memorable times with this "I'll be Home for Christmas" music box, exclusively from The Bradford Exchange. 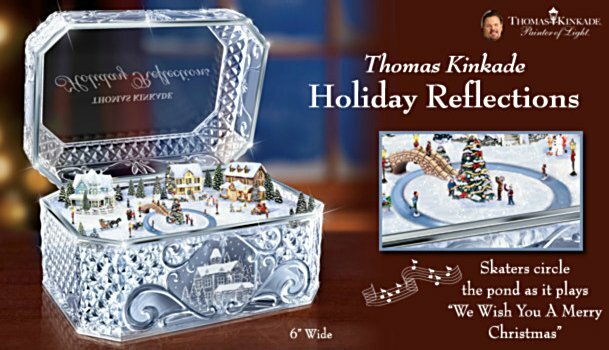 Exquisitely handcrafted in sparkling faceted crystalline, this Thomas Kinkade collectible music box features a fully-sculpted, hand-painted winter wonderland underneath its hinged lid. Kinkade's gracious, Victorian-era home, decked out for the holidays is surrounded by snowy landscaping, villagers, a miniature sleigh and more. Plus, with the turn of a key, this holiday treasure plays "I'll Be Home for Christmas" as an intricate holiday train circles around the scene. Edition is limited and strong demand is expected. Order now! There's no time like Christmas to celebrate the joy of family and friends. Now, you can revel in the greatest time of the year with this Thomas Kinkade music box collection featuring best loved Christmas carols beginning with Issue One, I'll Be Home for Christmas. Soon your collection will continue with Issue Two, Winter Wonderland and additional collectible music boxes, each a separate issue to follow. 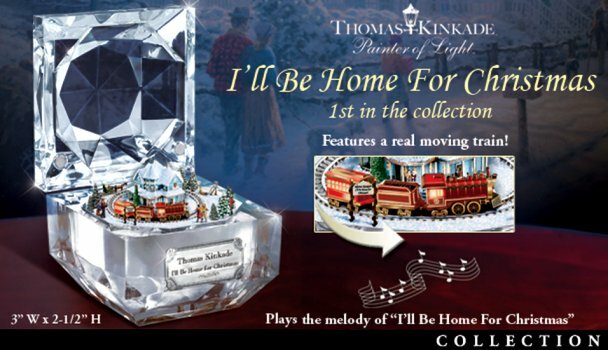 Exclusively from The Bradford Exchange, each Thomas Kinkade music box in this collection is exquisitely handcrafted in sparkling faceted crystalline and features a fully-sculpted, hand-painted winter wonderland and a motion feature underneath its hinged lid. Plus, each issue plays a favorite Christmas carol. Editions are limited and strong demand is expected for this festive holiday decor. Order now! Nothing says Christmas like togetherness, music, snow - and Thomas Kinkade! 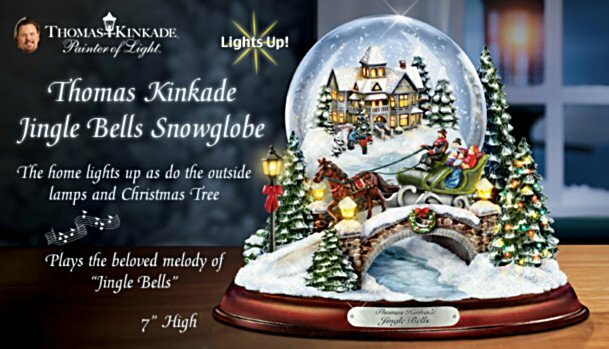 Now you can capture those warm Christmas memories with this first-of-a-kind Thomas Kinkade musical snowglobe, exclusively from The Bradford Exchange. This sparkling Thomas Kinkade holiday decoration is exquisitely handcrafted, fully-sculpted and intricately hand-painted. Inside the Christmas snowglobe is a fully sculpted holiday home inspired by Mr. Kinkade's award-winning "Victorian Christmas" artwork. The foreground scene captures the essence of the beloved "Jingle Bells" with holiday trees, a cobblestone bridge and more. Plus, at the flip of a switch, both jolly scenes illuminate, a flurry of snow moves within the globe and the melody of "Jingle Bells" plays. High demand is expected for this limited edition. Order now! Snow filled hills, Christmas trees and lights. There's no time like Christmas! Now you can capture the spirit of the season with this sparkling Christmas musical snowglobe, exclusively from The Bradford Exchange. Exquisitely handcrafted of artists' resin and meticulously hand-painted, this stunning Thomas Kinkade snowglobe features a fully-sculpted winter scene inspired by the Painter of Light??. A flip of the switch illuminates this charming scene while a gentle shake sets swirling snow in motion. For added delight, a silvery name plaque and Thomas Kinkade artwork grace the base. Plus, this festive Christmas treasure plays the beloved melody, "Jingle Bells." High demand is expected for this limited-edition keepsake. Order now! Thomas Kinkade 'Tis The Season To Be Jolly Christmas Musical Snowman Figurine: Lights Up! Surprises are part of what make the holidays so exciting, and this cheerful Thomas Kinkade snowman is bringing you an extra-special secret treat! Outside he's all top-hat-and-smiles, but open up his beautiful coat and he has a whole world of music, lights and animated holiday wonders waiting for you! What an enchanting way to uncover the joys of a Thomas Kinkade Christmas! 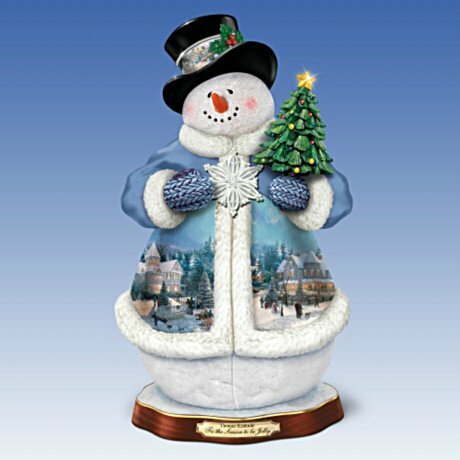 Available exclusively from The Bradford Exchange, this limited-edition snowman figurine is lovingly handcrafted. His top hat and cleverly hinged overcoat showcases Thomas Kinkade holiday artwork, expertly reproduced in vivid detail. Open his coat and an entire, glowing holiday village scene is revealed, complete with a hovering Santa's sleigh and a horse-drawn sleigh that really moves. He even plays 8 beloved holiday melodies! Very strong demand is expected for this jolly fellow, so don't wait - order now! On Christmas Eve, when it's ALMOST Christmas, Santa Claus is at his busiest, but he'll always take time to check his Naughty or Nice list. Now, inspired by the artistry of Thomas Kinkade, this heartwarming Christmas sculpture captures Santa as he prepares for the big night, creating a holiday treasure filled with lights, motion, and music! Presenting the Thomas Kinkade Almost Christmas Sculpture, a spectacular limited-edition first ever exclusively from The Bradford Exchange. This premiere masterwork is sure to become a treasured holiday heirloom, passed along from generation to Individually hand-cast in artist's resin and hand-painted in exquisite detail. Santa stands by his richly adorned sleigh, petting a gentle reindeer as he gives his Special List one more look. His bag, overflowing with toys, sits in the back of the sleigh. But take another look at the sleigh - it holds a fascinating treat: a miniature illuminated Thomas Kinkade village with a moving sleigh, "flying" high above the beautiful snow-covered sculpture scene as a medley of eight classic holiday melodies fills the air! Don't wait to make this magical heirloom-quality Thomas Kinkade Santa sculpture yours; intense demand is expected. Order now! Artist Thomas Kinkade's inspiring vision of the perfect setting of love - gentle rays of sunshine, vivid blossoms, and peaceful waters - has worked its magic on the most lovable of couples - Disney's Mickey Mouse and Minnie Mouse. It all comes to life in the Disney The Magic of Love Personalized Music Box, licensed from Disney and available in a custom design from The Bradford Exchange. Now you can place yourself in this picturesque garden by showcasing your two names "carved" within a heart on the tree. Gazing at the picturesque view, Mickey Mouse and Minnie Mouse, two adorable sweethearts, sit closely with their tails entwined in the shape of a heart. This Heirloom-quality Mickey Mouse and Minnie Mouse music box is handcrafted with a rich mahogany finish and rests on golden ball feet. The delightful garden artwork of Thomas Kinkade along with Disney's Mickey Mouse and Minnie Mouse and a heartfelt sentiment are featured on the sparkling glass lid. A golden frame beautifully accents the artwork and a decorative golden key and elegant black velvet lining serve as the perfect finishing touches. Plus it plays the melody "Always in My Heart" for an added sentimental touch. Strong demand is expected for this Mickey Mouse and Minnie Mouse Thomas Kinkade music box, so don't delay. Order now! On a magical winter's night, everyone has gathered around to share in a most special time. As the happy folks of the village celebrate the upcoming time of joy, the winter birds of the woodland add their merry greetings to the yuletide festivities. Now, you can enjoy this heartwarming moment with the Thomas Kinkade Winter Wonderland Snowglobe, available in a limited edition exclusively from The Bradford Exchange. This hand-painted snowglobe brings the sights and sounds of the season to life with lights, music and continuously swirling snow! Topped by a cardinal on a sprig of holly and fresh "snow", the crystal-clear globe illuminates from within at the touch of a switch, giving the fully sculpted Thomas Kinkade Victorian home inside the welcoming look of a house ready for holiday company - or a visit from Santa! But it's the swirling snow that makes this scene especially festive. A built-in water pump keeps the flurries flying at the touch of a switch. This gleaming snowglobe rests on a sculpted, snow-dusted hillside with a forest scene on one side that's a home for a flock of winter feathered friends. Across the way, a happy family sings carol after carol as others decorate the tree. Both the decorated tree and the pines in the forest glow with beautiful illumination. The lights on the tree actually change color as a medley of 8 holiday carols plays. A wood-toned base bears a golden title plaque, and a built-in timer turns the lights on and off at the same time each night. Strong demand is expected for this Thomas Kinkade holiday decor, so don't delay. Order now! Sleigh rides and snowman building. Gentle flurries swirling from the sky. Gracious homes all decorated and lit from within. And in the distance, the rumble of a train bringing family and friends back home for the holidays. These are memories and moments that make this season of harmony and joy so special. Now you can reflect upon the place they hold in your heart with the Thomas Kinkade Journey Home for the Holidays Snowglobe, a first-ever exclusively from The Bradford Exchange. 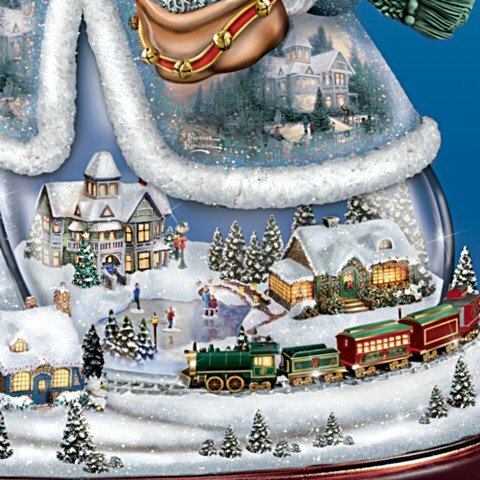 Enhanced by lights, music and a rotating train, this winter snowglobe embodies the joy of the holiday season. Individually hand-cast and hand-painted in fully sculpted detail, this Thomas Kinkade snowglobe boasts an abundance of specially designed features. The crystal-clear snowglobe is topped by a silvery star and houses a miniature village inspired by the holiday art of the Painter of Lightâ„¢. The church on the hill and both Victorian homes light up from within at the touch of a switch as a built-in water pump keeps snow swirling all around the village. Your snowglobe sits on a snow-covered landscape with pine trees, encircled by a railroad track. A miniature green and red steam train circles around the track, in and out of the tunnel carved into the mountainside while a a medley of 8 holiday carols fills the air. Presented upon a wood-toned base with a golden title plaque, it's sure to become a treasured part of your Christmas traditions, but strong demand is expected for this limited-edition treasure. Hurry - order now! The Nativity Story is a heartwarming reminder of the true meaning of Christmas. The luminous holiday paintings of Thomas Kinkade celebrated the Holy Season too, and now this tabletop centerpiece, inspired by his reverent artwork, will set your home aglow with the uplifting joy of the First Noel. Introducing the True Meaning of Christmas Tabletop Centerpiece, a Collectibles Market First showcasing an original design, available in a limited edition, exclusively from The Bradford Exchange. Uniting dazzling genuine crystal, an intricately sculpted Nativity, glowing lights, and even music with the lasting beauty of an Always in BloomÂ® floral arrangement, this stunning Thomas Kinkade centerpiece is sure to be the perfect Christmas Nativity for your holiday decor. At the base of your centerpiece is a an Always in Bloom arrangement showcasing textured evergreen boughs, holly leaves, snow-tipped pine cones, sprays of metallic berries and elegant white roses, all individually handcrafted from a soft silken material that rivals nature itself and highlighted by a gorgeous golden bow. At its center shimmers an expertly handcrafted, multi-faceted crystal flameless candle with an oval-shaped window that reveals a sculpted Nativity scene inside. Every detail of Joseph, Mary and Baby Jesus is intricately hand-cast and hand-painted. As it lights up from within, this spectacular Christmas centerpiece also boasts a flameless genuine crystal light at the top of the candle, while the sweet melody of "Silent Night" fills the air. It even has a built-in 5-hour timer! Strong demand is expected so don't wait. Order now!